Creative agencies, artists, and marketing firms alike can agree on one thing – an eye-catching, interactive website is key to drawing in new business and creating a memorable brand. While there are plenty of website templates out there that attempt to meet the needs of these professionals, only some hit the nail on the head. This editor’s choice template spotlight will highlight the Weebly Parallax template, which offers a contemporary, sleek spin on the online portfolio.The attention to detail comes through in nearly every aspect of this stylish, yet highly functional theme. When it comes to the wireframe of a website, Weebly Parallax offers a simple, user-friendly blueprint. Everything a visitor needs to see on your website can be found on one page. Indeed, the Parallax scrolling design makes transitions between the team biographies, services descriptions, and contact information a breeze. The full-width video section gives your images more room to jump off the page. To further ease movement within sections of the site, internal page jump links along the top of the template provide access to a specific section immediately. The enhanced scrolling feature also makes for a more mobile-friendly design. Thanks to the clean look, a user on a hand-held device can thumb down without missing any content. The Weebly Parallax template automatically adjusts itself to any tablet or smartphone screen. Index.html. This option lets you upload a static image with typewriter-inspired text. Tall-Header.html. This home page style has a responsive background slider, and you can edit the image captions in just seconds. Selling yourself by describing your ideas is good, but a picture really is worth a thousand words, so providing portfolio examples of your past work is often what coverts potential prospects to current clients. 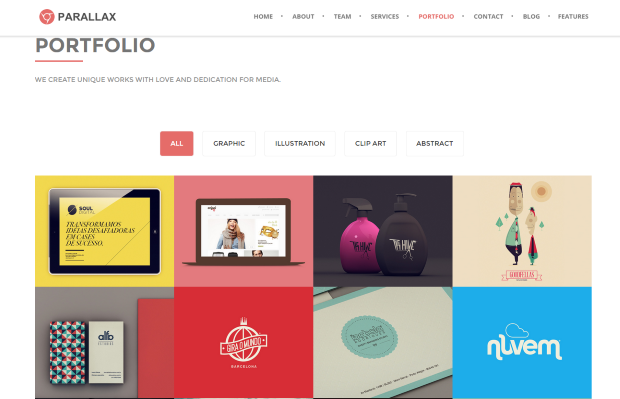 With that in mind, Weebly makes the right move by equipping Parallax with a portfolio section. Even better, the portfolio is interactive, and users won’t have to leave the main page to see different examples of your work. Share up to four different types of designs or samples, such as “Graphic,” “Clip Art,” “Illustration,” and “Abstract” all on the home page. The template shows all portfolio samples by default, and users can filter by category – the samples quickly filter before their eyes, all on the same URL. 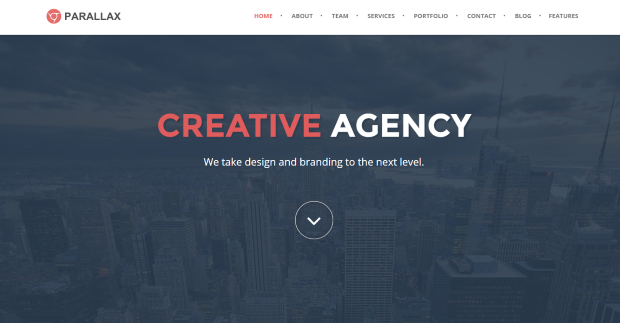 The blogging capabilities on the Parallax template are another reason this web design template is an editor’s choice. 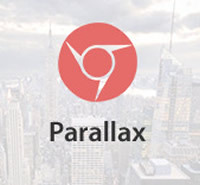 When you’re doing web design with Parallax, you can quickly create a space where you keep people informed about new services, upcoming events, and your advice as an expert. Blogging improves your website’s SEO by providing frequent content updates, and it engages visitors and offers them a reason to return to your site soon. Make good use of your Parallax blog space with regular posts and the addition of images and media. Your website template should align with your brand, and the Weebly Parallax template makes it easy to edit the site to your specifications and perfectly reflect that brand. With customizable interactive widgets, you can give your site improved functionality and incorporate social media links into your Weebly Parallax page. Add your tag line, incorporate your brand personality, and set your site live in no time at all. Want to learn more about templates and building a website? Check out these tips for how to use a business website builder.